Coal ash is the waste produced from burning coal in coal-fired power plants. It is one of the largest types of industrial waste in the U.S., according to the Environmental Protection Agency. Coal ash contains toxins such as arsenic, boron, cadmium, chromium, lead, radium, and selenium. These are toxins which can cause health problems that include cancer, heart disease, reproductive failure, and stroke, and brain damage in children. Smoking a pack of cigarettes every day is less dangerous than living near a wet coal ash storage pond, according to the EPA’s own assessment. People who live within a mile of unlined coal ash ponds have a one in 50 risk of cancer, which is 2,000 times higher than what the EPA considers is acceptable. About 100 million tons of coal ash are produced every year by coal-fired power plants. And when there is a spill of coal ash, it causes major problems. The 2008 coal ash spill in Kingston, Tennessee caused over five million cubic yards of coal ash to be spilled which destroyed dozens of homes and caused health problems for those who cleaned it up. The 2015 coal combustion residuals rule requires coal-fired electric plants to publicly report groundwater monitoring data, starting in 2018. The rule is the first ever federal safeguards against coal ash pollution. EarthJustice produced a report which looked at the data. What they found is that over 95 percent of the coal ash ponds in the U.S. are unlined and nearly all of them are leaking toxins into groundwater that is considered safe to drink by the EPA. Over 550 units at 265 plants reported groundwater monitoring data, which is about three-quarters of the coal-fired power plants operating in the U.S. Based on that data, 91 percent of the plants are causing groundwater contamination with toxins at levels that exceed federal safety standards. The reason that the rest of the coal power plants do not post groundwater data is because they were eligible for an extension or exemption or closed their ash dumps before the rule took effect in 2015. The majority of coal plants have unsafe levels of at least four toxins present in coal ash, the report also found. Groundwater at more than half (52 percent) of coal plants has unsafe levels of arsenic, which causes cancer and is also a neurotoxin that harms the brains of children. Most coal plants (60 percent) have unsafe levels of lithium which causes multiple health problems, including neurological damage. The EPA and private interest groups have identified at least 24 sites private wells contaminated by coal ash. Private drinking wells are not tested by either by companies or state regulators, and contamination of those wells goes undetected for years. The EarthJustice report identifies problems with the rule. One of them is that it does not include older, closed coal ash dumps even if they contaminate groundwater. 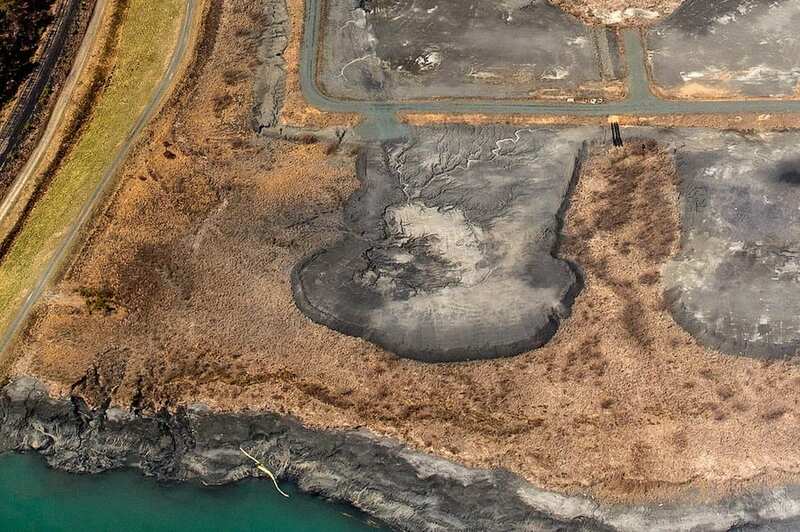 There are hundreds of closed coal ash dumps across the U.S. Most coal-fired power plants have both active and inactive ash dumps. Because the inactive ash dumps are not regulated, it can be harder to discover groundwater contamination from them. The Trump administration tried to weaken the rule last July. The U.S. Court of Appeals for the D.C. Circuit issued a ruling that found the 2015 rule is inadequate to protect communities and the environment from coal ash pollution. The Court ordered the EPA to revise the rule to provide sufficient protection for health and environmental threats from coal ash dump sites. Earthjustice has recommendations for the Trump administration to properly regulate coal ash waste. They include regulating all coal ash dumps, both active and inactive ones, requiring more transparency, and requiring more monitoring. Coal ash waste is reusable. Researchers from North Carolina’s A&T University created a composite building material from landfill plastic and coal ash waste ponds. By using coal ash to create a needed product, they demonstrated that a constructive use can be found for toxic waste.